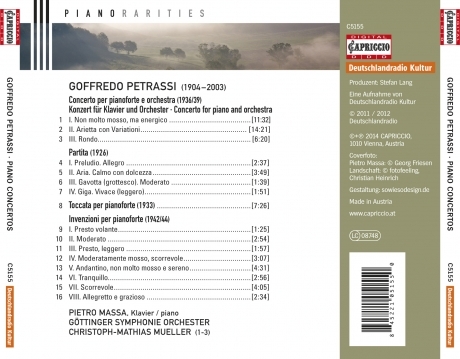 In addition to Luigi Dallapiccola (1904-1975), the Roman composer Goffredo Petrassi (1904–2003) represents a salient figure in the development of Italian music history in the 20th century. His career as a composer began in 1934, when Alfredo Casella conducted his Partita for orchestra at the Festival of the International Society for New Music in Amsterdam. 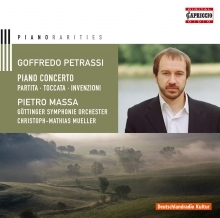 Petrassi’s ensuing recognition led to him taking over central positions in Italy’s music scene of the time. From 1937 to 1940, he was the general director of the Teatro La Fenice in Venice; from 1947 to 1950, he directed the Accademia Filarmonica Romana and from 1954 to 1956 he was head of the International Society for New Music. He commenced his teaching as a member of the Accademia S. Cecilia, and after 1939 he worked as a composition teacher at the conservatoire, where he finally took over the master class for composition in 1960. He died in Rome in 2003 at the age of 98.